This is my latest offering :D, it isn't even a back dated one! the last sock came of the needles last night while the recipient; my Sister in Law, waited patiently for them, and was then kind enough to pose for me for some pictures! 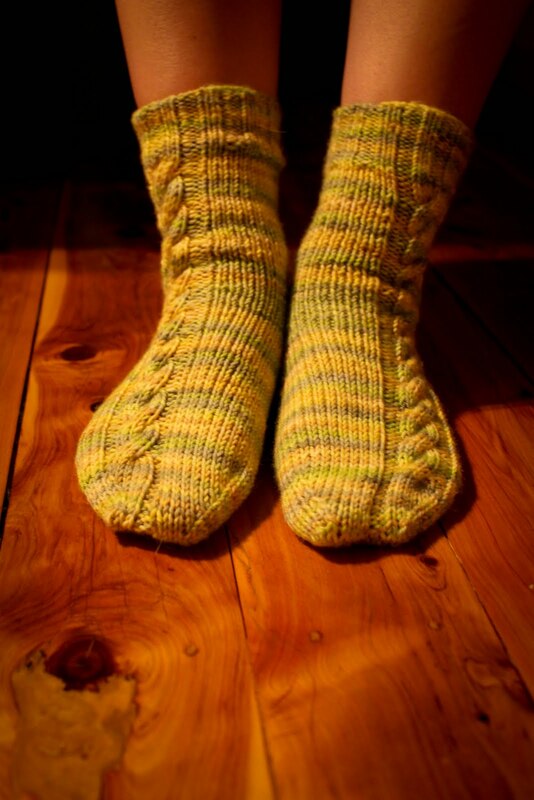 These socks are my own pattern, made up as I go, as I so often do! My SIL is a great person to knit socks for. See I have teeny feet, so after knitting for me, knitting for someone with a size 9 foot is horribly epic. SIL however, has tiny and considerate feet, thanks hon! The other advantage is that it is super easy to get the right size.... when it is my size too. 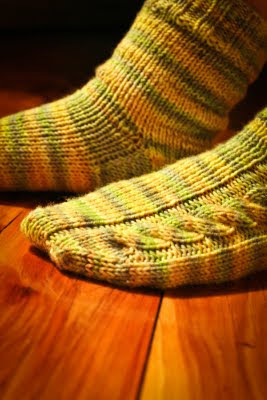 They are knit from Blue Moon Fiber Arts Socks that Rock Heavyweight in colourway 'Lemongrass'.